Are you looking to hire the services of a professional concreting team to enhance the look and feel of your concrete driveway Sydney? A beautiful, smooth driveway is safer for you & your vehicle, not to mention increases the value of your home. If you are tired of looking at your dull and boring Pebble Crete or cracked concrete surface, then getting concrete resurfacing will be like a mini face-lift for your home and is the most cost efficient and economical way to dramatically improve the concrete areas you walk on every day. Most people think of the boring uses of concrete like public sidewalks which are dull and grey whereas nowadays you have a incredible range of concrete resurfacing options available to you. The first port of call starts with a consultation with a professional Wizcrete concrete contractor Sydney. You’ll literally have dozens of amazing concreting stencilling options at your fingertips but before you get carried away it’s important that both decision makers have sat down together and established exactly what you are looking to achieve. Initially the challenge you’ll face is selecting just the one option from the countless concrete stencils, stamped concrete or decorative coloured concrete options available. This is when you have to stay strong and stick to your original game plan so you come in within budget and on time. One thing for sure is that you’ll know exactly what costs you’ll have on your new concrete resurfacing job whether you get a new concrete driveway, concrete poolside upgrade or a new, modern looking concrete patio. As an award winning company, if you are in need of a concrete contractor Sydney, we are well positioned to assist you with your concreting needs and our Amazing Triple Guarantee means the risk is 100% on us. Below you’ll find a list of the Concrete Services we offer in and around the Sydney metro area. Exploring your options for aging concrete? We specialise in concrete resurfacing in the Sydney metro area whether it be cracked, weathered or tired looking concrete we can look after you. View our range of photo’s to see the quality of our work. Concrete Driveways are literally the first impression people get of your Sydney home. Create a stylish, modern looking concrete driveway backed by our Triple Guarantee with lots of testimonials & photo’s inside. Looking for a Stamp Concrete solution in Sydney? You’ve come to the right place as we have a wide range of attractive, stylish stamp concrete options available for you to choose from. We back all our work by an amazing Triple Guarantee. PebbleCrete is one of the most common concrete surfacing options but is ugly, unsightly and extremely difficult to clean. Learning how to clean pebblecrete is a mission in itself. Concrete repair in Sydney is quite common simply due to the age of the city itself and the homes in the area. The most important part of concrete repair is to ensure the surface is perfectly clean before you get started. If you are looking for a Decorative Concrete in Sydney and need some more information and education to make an informed decision then check out our Before and After photo’s to get a feel for the type of quality work we do and how we look after our customers. If you are looking for a Concrete Contractors in Sydney and need some more information and education to make an informed decision then check out our Before and After photo’s to get a feel for the type of quality work we do and how we look after our customers. Pressure cleaning can be done on any type of concrete surface. Our professional tradesman will ensure the job is done to your satisfaction without damaging your concrete’s surface. We provide a wide range of concrete stencils for homes in the Sydney metro area. Discover how Concrete Stenciling your Sydney driveway will add immense value, increase your equity and create a modern, fresh look to the front of your home. Find out what our concrete stencil triple guarantee is all about. Solutions to your Concrete repair or concrete driveway repair in Sydney can often be easier than what you first imagine. 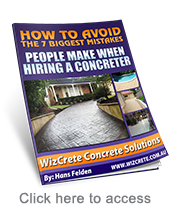 The trick initially is to ensure you find a qualified and experienced concreter to offer their suggestions to ensure you are on the right track. Keeping your concrete driveway cost down is essential and we have some great tips on this page that will not only help you keep your concrete costs down but give you some brilliant design ideas too.